RoadRUNNER Motorcycle Touring & Travel magazine is highlighting 10 of the best touring destinations around the world. 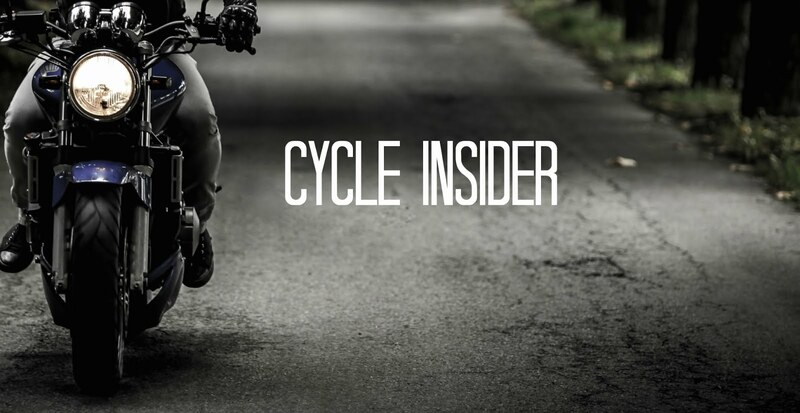 The editors of North America’s premier touring resource have discovered some hidden gems after many years on the road and countless miles ridden. Once you’re ready to ride, search for tankbag maps and GPS files from any of RoadRUNNER’s 380 plus U.S. and international tours archived online. 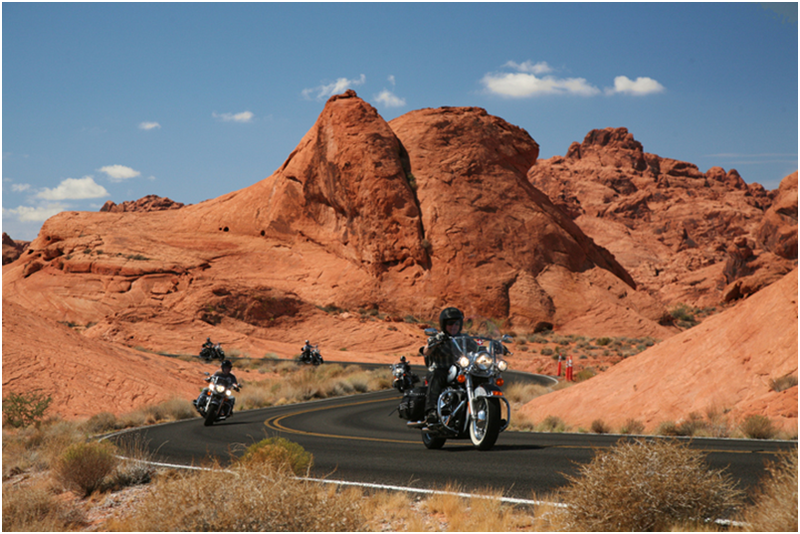 A string of Harley-Davidsons carve across pristine asphalt in the Valley of Fire. Just a stone’s throw from Las Vegas, Nevada’s Valley of Fire State Park offers spectacular views of red sandstone monoliths that seem to burn in the light of the afternoon sun. State Route 167 twists and turns through the park and along the shores of Lake Mead before running into the Valley of Fire Highway. A BMW twists along the stunning Atlantic Ocean coastline. 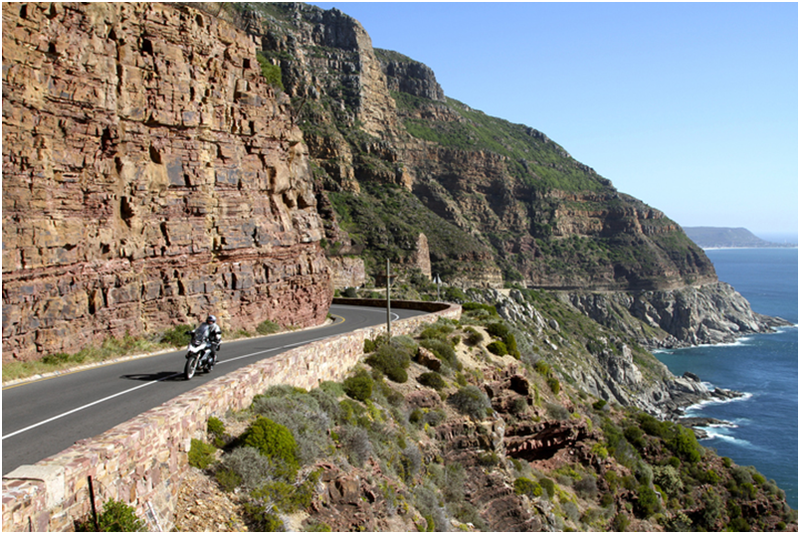 Just south of Cape Town Chapman’s Peak Drive is etched into the cliff face above Haut Bay. The “Chappies,” as locals know it, isn’t long at just over five and a half miles but it crams a healthy 114 curves into that short distance. And the view! The Hawk’s Nest is a sport touring rider’s dream come true. 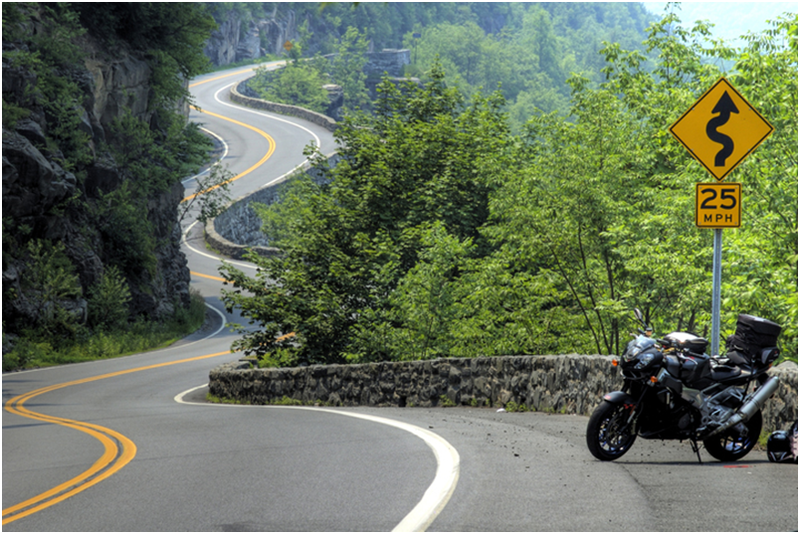 Far from the traffic and congestion of New York City, the Catskill Mountains are an intriguing escape for motorcyclists seeking mountain views and twisty roads. State Route 97 follows the course of the Delaware River and serves up some of the best riding on the East Coast. 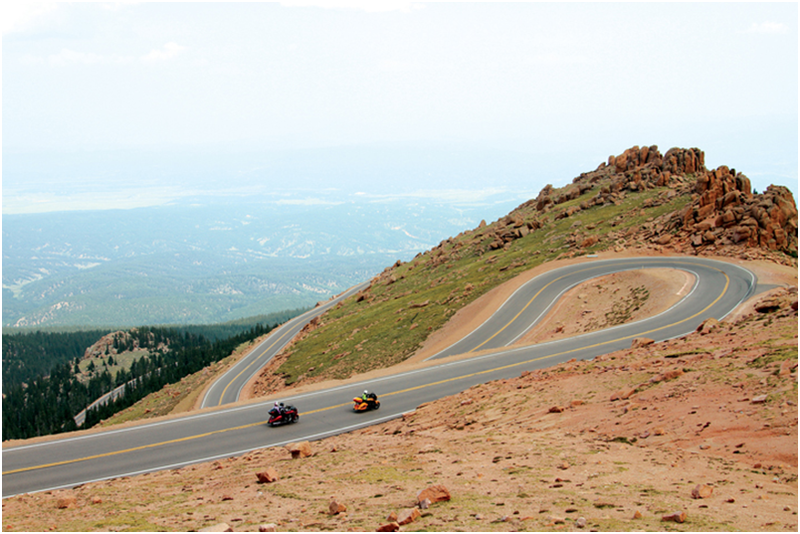 The Pikes Peak Highway twists back and fourth across the mountain’s face, rising higher with every turn. This 14,115-foot mountain may be famous as the sight of the Pikes Peak International Hill Climb, but the sinuous, fully paved 19-mile path to the top isn’t just appealing to racers. The continuous stream of switchbacks and high-altitude views make for an adrenaline pumping experience for everyday riders too. 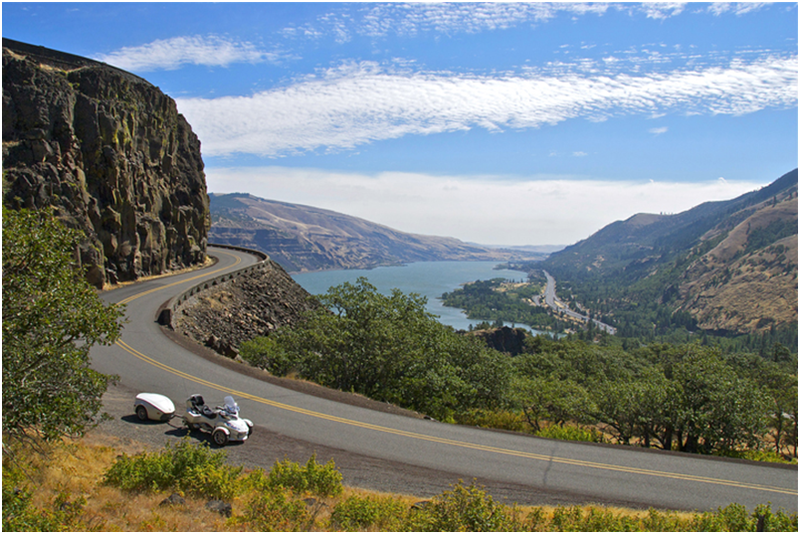 The Columbia River Highway was the first planned scenic byway in the U.S.
Slicing through the Cascade Mountains along the border between Oregon and Washington, the Columbia River Gorge is a testament to time and the power of the river. For riders it offers expansive views of the mountains and river around each bend (and there are quite a few). Mountain lakes, rivers, and waterfalls can be found in abundance along the 28’s wandering course. Legend has it that rum runners would tear up and down 28 hauling their illegal concoctions while running from the revenuers, which is where this twisty mountain masterpiece gets its name. 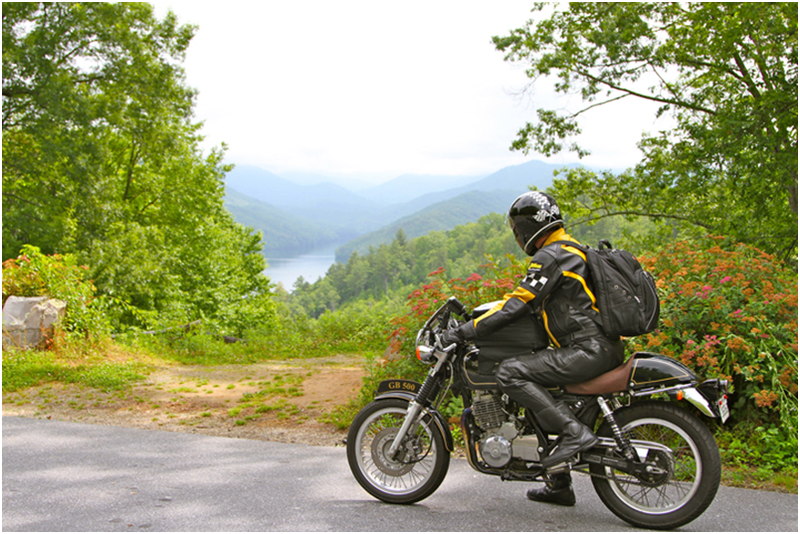 Today the 105-mile stretch of road in Western North Carolina is a visual and riding feast for motorcyclists. Brilliant Blue Ridge Mountain scenery is Skyline Drive’s main draw. At the northern end of the famous Blue Ridge Parkway, Virginia’s Skyline Drive takes up where the BRP left off. 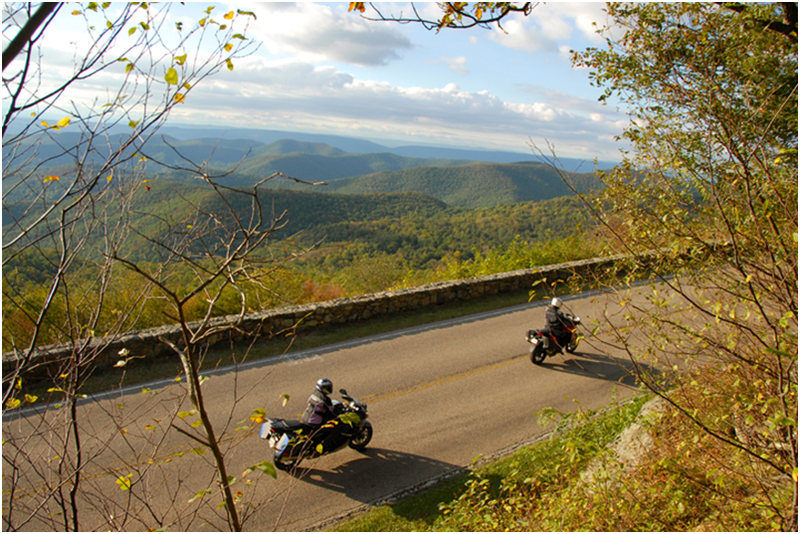 The road winds for 105 beautiful miles through Shenandoah National Park with 75 scenic overlooks along the way. The ride is especially beautiful when the fall colors are at their peak. 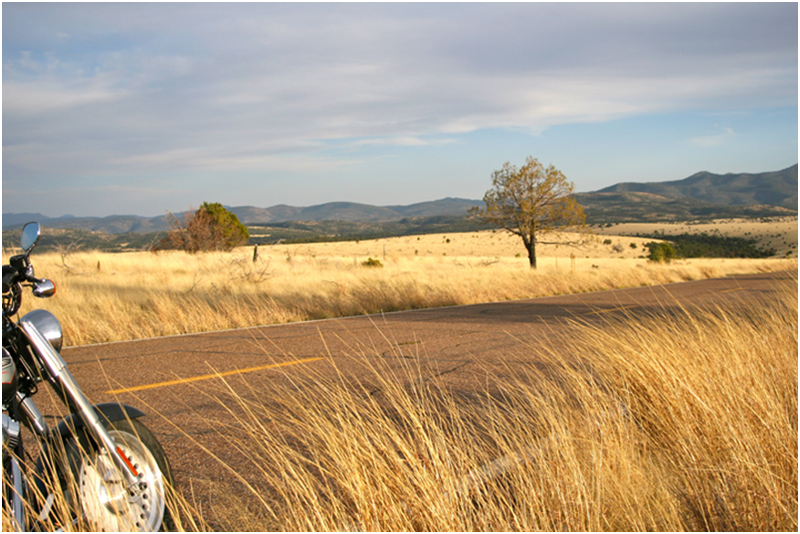 The stretch between Springerville and Morenci, AZ is one of this route’s many highlights. Originating in Arizona and including the wonderfully curvy Coronado Trail Scenic Byway, U.S. Route 191 wanders north for over 1,600 miles to the Canadian border. Along the way the road traverses the wide-open landscapes of the American West with a stopover at Yellowstone National Park just to sweeten the deal. The pass has earned a reputation as one of the most spectacular roads on earth. The pride of the Swiss Alps, Gotthard Pass crosses “Devil’s Bridge” before rising to 6,909 feet in a dizzying succession of switchbacks. 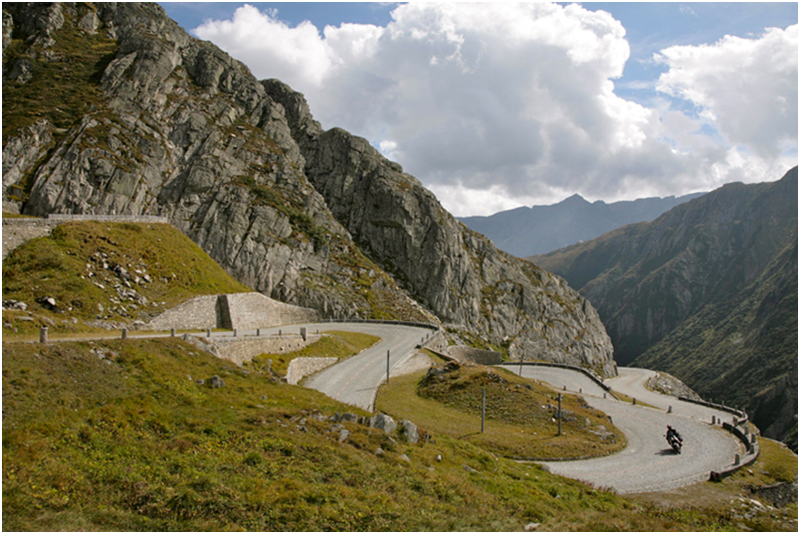 At the top riders are greeted by unforgettable alpine views and a museum dedicated to the road’s construction. It's a special experience riding over Gotthard’s cobblestones. 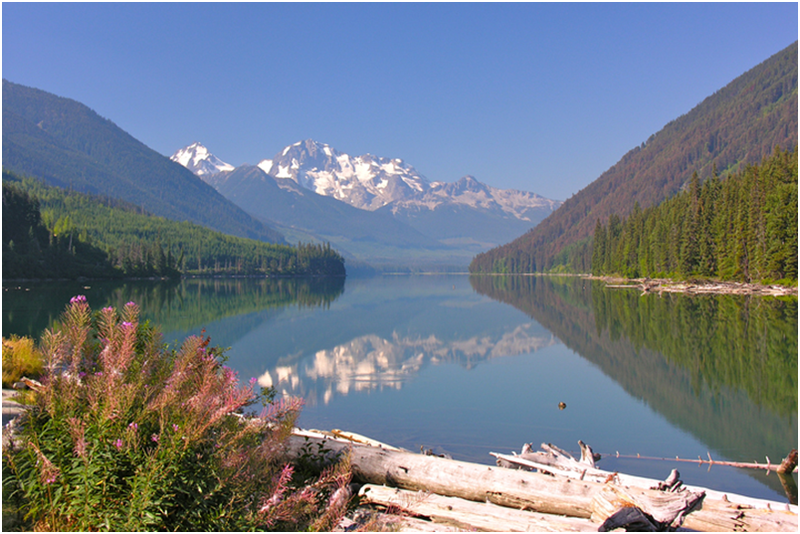 Duffey Lake is just one of the multitude of scenic stops along Highway 99. Highway 99 looks like any old highway as it leaves Vancouver, but it isn’t long before its character changes. Climbing high into the Coast Mountains, 99 becomes the Sea to Sky Highway showcasing the rustic beauty British Columbia is known for. It continues on as Duffey Lake Road with perilous curves carving higher and deeper into the mountains. To find even more places to ride including tankbag maps and ready to follow GPS files, pick up a copy of RoadRUNNER Motorcycle Touring & Travel magazine at Barnes & Noble or other quality bookstores around the world. Subscribe now and benefit of a special promotional rate. This article is published with the permission of RoadRUNNER Motorcycle Touring & Travel Magazine. It is not for sale or redistribution. RoadRUNNER is a bimonthly motorcycle touring magazine packed with exciting travel articles, splendid photography, maps and GPS files. Subscriptions are available on our website, or by calling (866) 343-7623. Thank you very much for the interesting article. Very pleased that America has many interesting possibilities. I advise you to look more here las vegas show tickets. Good luck.